The third largest city of Switzerland is Basel. It is not as popular as Zurich and Geneva. The population of Basel is approximately 166209. 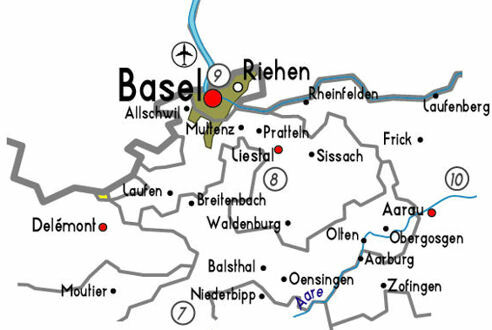 The location of the city of Basel is within the border of France and Germany. The Rhine river cruise terminal is Basel. Basel consists of wealthy patrician family and they are very rich in art from the time of Renaissance. More than twelve museums are located in Basel. You can reach Basel from any part of the country by bus, train and flight. Just because it is located beside the river Rhine, it experiences a mild climate. It gets a good amount of sunshine and fog occurs in autumn. During December, the climate is very cold. It is generally minus degree during the winter season and you can always expect snow. Some of the places in Basil have tourist attraction like Basel Munster, Rathaus (Basel's Town Hall) and Munsterplatz. The old town of the Basel is another tourist attraction and is one of the most historic places in Basel. Apart from the heritage sites, you will also get to see Monasteries and churches, Secular Buildings, Archeological sites and museums. Basel is famous for its different types of sports. The sports that you will find in Basel are Football and ice hockey. You will also get huge football stadium and ice hockey hall. In the month of October, Basel organizes tennis competition. Earlier you came to know about the theatres of Basel the opera and the ballet are the most popular one. Starting from 1493 the University of Basel is one of the oldest and very popular universities in Switzerland. You will be able to see the zoological garden and botanical garden in Basel. This also mainly attracts the tourist. You can always recommend your family and friends to visit Basel, as you will get to see many things over here along with the beauty of Switzerland. The city of Basel is also less expensive than that of the other cities of Switzerland. However, it is not as popular as a tourist spot but with the rich culture and historic importance, people have started liking Basel.